AdvantaClean of Metro New Orleans is the authority on moisture and ventilation issues in crawl spaces and the preferred local contractor for ATMOX Crawl space Ventilation systems. (www.atmox.com). We are also the only local company certified as Crawl Space Encapsulation Specialists with Santa Fe Moisture Control Solutions, a leading national provider of crawl space and basement dehumidifiers. (http://www.santa-fe-products.com/). AdvantaClean of Metro New Orleans is a licensed Mold Contractor with the LSLBC (State License info), a certified mold remediation company with both NORMI and MICRO, an IICRC-certified water damage restoration firm, and a member of NADCA. All of this means that we can bring a wealth of knowledge and experience to your unique crawlspace moisture issues. We are not a “one-trick pony” when it comes to protecting your house from crawl space moisture. We will provide options for permanent solutions for controlling moisture issues in the crawl space under your home. Whether that is installing a vapor barrier, adding an ATMOX system, changing the slope and grading of your property, or completely sealing your crawlspace, AdvantaClean can do it. And, unlike our competitors, we are willing to guarantee our work, so you can rest easy. Do not fall prey to other “inspectors” who only want to recommend one type of service that they sell under a different company name. Let Us Inspect Your Crawl Space Today! In our environment, moisture in crawl spaces can lead to major issues with mold, wood rot, and termites. Common signs of moisture issues under your home are wood floors cupping or warping, smells commonly associated with mold and/or mildew, and respiratory issues with occupants and visitors to the building. All homes in the New Orleans area should be inspected annually for termites. Be sure to ask your pest control company to tell you if they see signs of mold growth in your crawl space. Moisture attracts not only termites, but also mold growth. Excessive moisture in crawl spaces can lead to wood rot and problems with air quality inside the home. Left unchecked, it is common for moisture and mold problems in crawlspaces to cause tens of thousands of dollars in damage. This damage is typically NOT covered under your homeowner's insurance and can result in a large out-of-pocket expense. AdvantaClean will assess your crawl space and provide you with multiple options tailored toward solving your moisture issues. 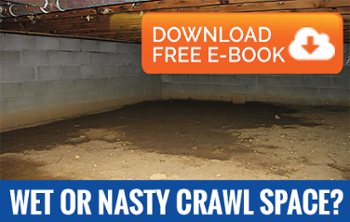 Every crawlspace is different, so why should the solution always be the same? The answer is it shouldn’t, so talk to a company that can provide you with options and advice, not a one-size-fits-all solution that may be overkill or unnecessary or, worse, inadequate to your crawl space needs.